Steam rises from the U of S Central Heating and Cooling plant on Jan. 8, 2019. Earlier this month, Saskatchewan became one of four provinces in Canada to have the federal carbon-pricing plan implemented. Although the implications of the policy are still not entirely understood, one thing is certain: the University of Saskatchewan will be impacted. Similar to those in Manitoba, New Brunswick and Ontario, facilities in Saskatchewan that emit more than 50,000 metric tons of carbon dioxide must now use an output-based pricing system for emissions. According to the 2016 Greenhouse Gas Inventory Report, the U of S carbon dioxide emissions for the 2015-2016 academic year were 162,900 metric tons of carbon dioxide, meaning that the U of S exceeds the threshold for the carbon tax. At the time of this article’s publication, U of S Vice-President Finance and Resources Greg Fowler has not returned the Sheaf’s request for comment about how the U of S will be financially impacted by the carbon policy. However, Erin Akins, the sustainability initiatives co-ordinator for the Office of Sustainability, says there is still much to understand about the carbon policy. 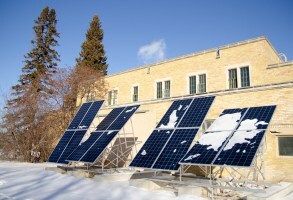 Since 2012, the primary environmental policy for the U of S is the Climate Action Plan, which outlines the university’s goal to reduce greenhouse-­gas emissions by 20 per cent, from the emission levels in 2006-2007, by 2020. As of 2016, the university’s emissions decreased by 1.1 per cent, meaning that the U of S would need to decrease its emissions by an additional 18.9 per cent in four years to meet its target. Kevin Hudson is the energy and emissions officer at the U of S and the person overseeing the university’s CAP as well as the implementation of campus-wide initiatives that reduce the university’s greenhouse-gas emissions. He is currently working on the U of S emissions report, the last report being from 2016, and expects it to be completed sometime in May. Hudson acknowledges that the required reduction in emissions is a “big number” but that the U of S is still committed to the 57 initiatives outlined in the 2012 CAP. With one year left to ensure that the U of S reaches the targeted greenhouse-gas emissions and with the federal government’s carbon policy, Akins says that the CAP does require updates, but it is still useful.